Sexual Harassment and Assault in Schools. Both sexual harassment and sexual violence are prohibited in schools under federal law ― yet many students still experience harassment and assault, which can have a devastating impact on their lives. To learn more about sexual harassment and assault in schools as well as available resources, visit the National Women’s Law Center. In the wake of sexual assault allegations against a host of powerful men and the rise of #MeToo to denounce sexual assault and harassment, we know many educators are wondering what to do. Answer has two lesson plans that can help teachers educate young people about respecting each other’s boundaries, getting clarification when they aren’t sure consent has been given and communicating clearly about what they do or don’t want to do. Health education curricula to reduce HIV/STDs in young people should be inclusive for all students. Advocates for Youths’ Rights, Respect, Responsibility (3Rs) endeavors to be the first K-12 curriculum that affirms LGBTQ youth and teaches the respect and dignity that all young people deserve. Please join Advocates for Youth for the LGBTQ Inclusivity and Sexual Health Education webinar on Wednesday, February 28th from 1- 2 pm EST. Upon completion of the webinar, attendees will be able to explain why inclusive sexual health education is critical for LGBTQ youth, provide strategies to adapt lesson plans to make them more inclusive for LGBTQ youth, and highlight unique features regarding inclusivity of the Rights, Respect, Responsibility (3Rs) curriculum. Click here to register! Adolescence is a period of remarkable physical, cognitive, social and emotional changes that impact behaviors, relationships and health. Promising research from the field of developmental neuroscience on changes occurring in the social-emotional processes in the adolescent brain provides opportunities for educators, applied researchers and program developers to bridge from these new scientific advances to the improvement of young people’s sexual health and relationships. Stopping School Pushout is a series of reports from the National Women’s Law Center that centers the experiences of girls—those who have suffered harassment and sexual violence; who are pregnant and parents; girls of color; girls involved in the juvenile justice system; girls in foster care; those who have experienced homelessness; girls with disabilities; and LGBTQ girls—examining the educational barriers they face and offering recommendations to address them. This report, by the Annenberg Institute for School Reform at Brown University, suggests the paths by which building parents’ leadership capacity could lead to ripples of reform in policies and programs for children. The authors collaborated with parent leaders, researchers, practitioners, and experts in the field to develop a draft theory of change showing how parent leaders might transform themselves and their children, families, communities, and states. Date & Location: February 16-18, 2018 in Orlando, FL. Registration for the fifth annual Time to Thrive conference is now open! 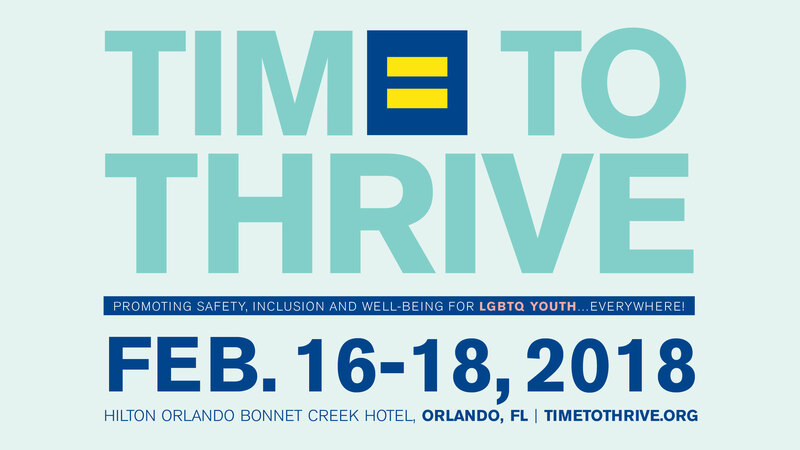 The Human Rights Campaign Foundation in partnership with the National Education Association and the American Counseling Association present Time To THRIVE, the annual national conference to promote safety, inclusion and well-being for LGBTQ youth…everywhere! Presenters: Mary Beth Szydlowski (Advocates for Youth) and Lacey Rosenbaum, PhD (American Psychological Association) will be presenting on Building Sustainable Systems of Support for LGBTQ Students on Saturday, February 17, 2018 at 2:45 PM. Date & Location: March 20-24, 2018 in Nashville, TN. Registration for the 2018 SHAPE America National Convention & Expo is now open! Enhance your professional practice in health education through sessions on a variety of topics including: skills-based Health Education, Opioid-Abuse Prevention, Assessments, the Whole School, Whole Community, Whole Child (WSCC) Model, Teacher Preparation, Sexuality Education and more. At the conference you’ll connect and learn from innovative educators and leave inspired by new ideas! Click here to register! Registration for the Stonewall National Education Project Annual Symposium is now open!